Dr. Anne Kornahrens is a AAAS Science & Technology Policy Fellow hosted by NSF from 2017-2019. She is a part of the Office of the Assistant Director for the Directorate for Mathematical and Physical Sciences (MPS) and focuses on projects in a variety of areas: broadening participation, large facilities, communications & policy. She enjoys working with MPS’s five divisions (Astronomical Sciences, Chemistry, Materials Research, Mathematical Sciences and Physics) and is particularly excited to be working on a project looking at Education & Public Outreach (EPO) at MPS’ large facilities. Prior to NSF, Dr. Kornahrens completed a joint PhD with the University of Oxford (UK) and the Scripps Research Institute (La Jolla, CA) in biochemistry/chemistry. Her research was in the area of synthetic chemistry, with a particular emphasis on designing routes to and building biologically relevant small molecules. 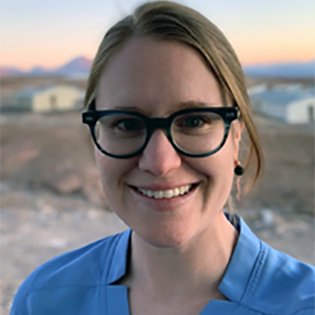 Her additional expertise comes from working as an STEM outreach advocate for the Association for Women in Science (AWIS) where she developed new programs to engage the community, and specifically young women, in informal STEM learning and mentoring. Dr. Anne Kornahrens other interests include rock climbing, reading and traveling. Participate in a focused discussion and brainstorming session on branding, (re)naming and social media. Will allow for a deep drill into the hot topics that came up on day 1. Take part in a discussion and brainstorming session on STEM, EPO diversification and cross-center collaboration. Will allow for a deep drill into the hot topics that came up on day 1.